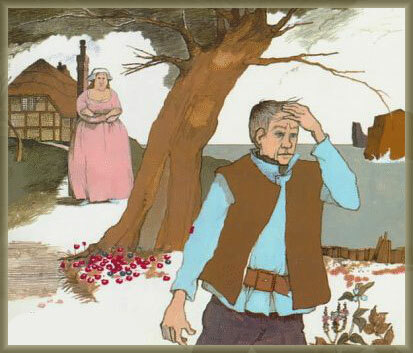 There was once a fisherman who lived with his wife in a pigsty, close by the seaside. The fisherman used to go out all day long a-fishing; and one day, as he sat on the shore with his rod, looking at the sparkling waves and watching his line, all on a sudden his float was dragged away deep into the water: and in drawing it up he pulled out a great fish. But the fish said, 'Pray let me live! I am not a real fish; I am an enchanted prince: put me in the water again, and let me go!' 'Oh, ho!' said the man, 'you need not make so many words about the matter; I will have nothing to do with a fish that can talk: so swim away, sir, as soon as you please!' Then he put him back into the water, and the fish darted straight down to the bottom, and left a long streak of blood behind him on the wave. Then the fish came swimming to him, and said, 'Well, what is her will? What does your wife want?' 'Ah!' said the fisherman, 'she says that when I had caught you, I ought to have asked you for something before I let you go; she does not like living any longer in the pigsty, and wants a snug little cottage.' 'Go home, then,' said the fish; 'she is in the cottage already!' So the man went home, and saw his wife standing at the door of a nice trim little cottage. 'Come in, come in!' said she; 'is not this much better than the filthy pigsty we had?' And there was a parlour, and a bedchamber, and a kitchen; and behind the cottage there was a little garden, planted with all sorts of flowers and fruits; and there was a courtyard behind, full of ducks and chickens. 'Ah!' said the fisherman, 'how happily we shall live now!' 'We will try to do so, at least,' said his wife. 'Well, what does she want now?' said the fish. 'Ah!' said the man, dolefully, 'my wife wants to live in a stone castle.' 'Go home, then,' said the fish; 'she is standing at the gate of it already.' So away went the fisherman, and found his wife standing before the gate of a great castle. 'See,' said she, 'is not this grand?' With that they went into the castle together, and found a great many servants there, and the rooms all richly furnished, and full of golden chairs and tables; and behind the castle was a garden, and around it was a park half a mile long, full of sheep, and goats, and hares, and deer; and in the courtyard were stables and cow-houses. 'Well,' said the man, 'now we will live cheerful and happy in this beautiful castle for the rest of our lives.' 'Perhaps we may,' said the wife; 'but let us sleep upon it, before we make up our minds to that.' So they went to bed.